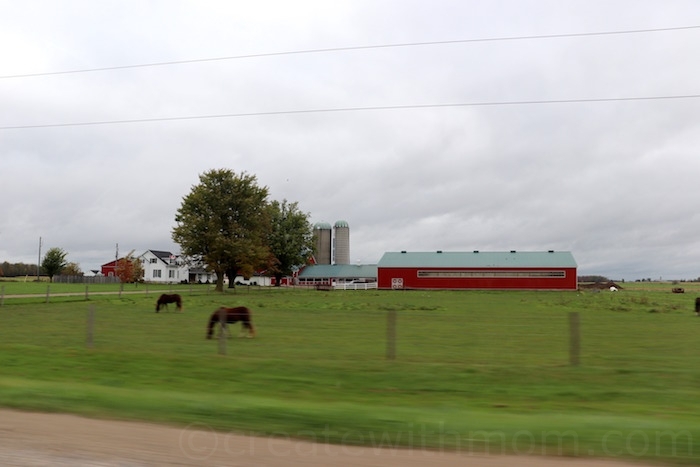 Our first stop was at the Point Farms Provincial Park. We enjoyed the beautiful warm weather and hiked the trails that led to the shores of Lake Huron. We wish the trails were clearly marked at this quiet, peaceful park. 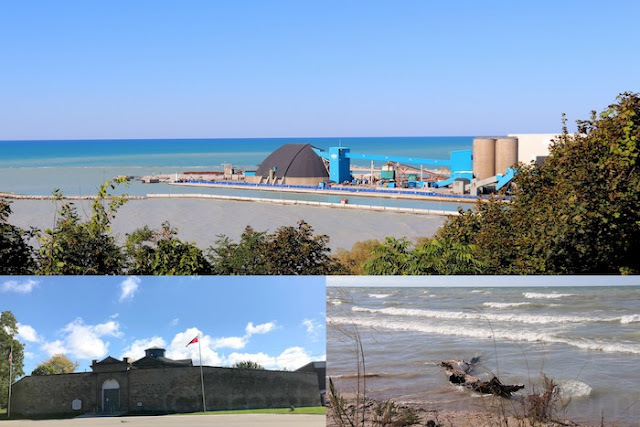 We then headed to see the Goderich Lighthouse that is at the top of Goderich bluffs, and saw the Sifto salt mine and factory. We read many interesting historical facts as we walked on the boardwalk by the coast of Goderich beach. 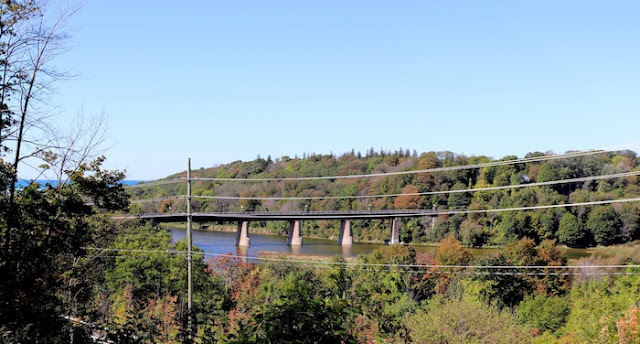 Although we had planned to visit the famous Gaol, pronounced jail, and the Goderich Museum, it was closed with short notice due to the Thanksgiving weekend. Opposite these attractions we can see the Menesetung Bridge. It was relaxing to sit back and take in the beauty of the "prettiest town in the West Coast". After a fun, but tiresome day we were happy to check in to the Dreamz Inn. This contemporary designer hotel is a gem of a place. We love its beautiful, bright, welcoming space. The room is equipped with all the modern conveniences, which made our stay comfortable. The spacious room has a microwave, coffee machine, mini-fridge with freezer and complimentary pop and water bottles, lounge area with a sofa and sitting room table, work desk with a swivel chair, electric fireplace, television, lots of lighting, robes, slippers, safety box, hair dryer, and more. 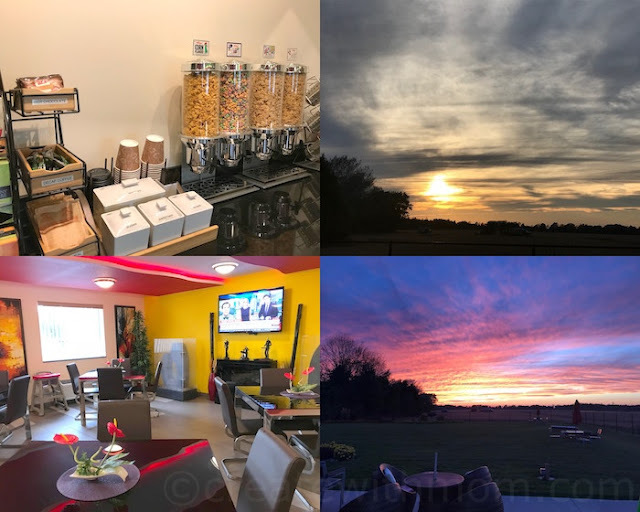 We spent the evening enjoying a variety of amenities at the Dreamz Inn. 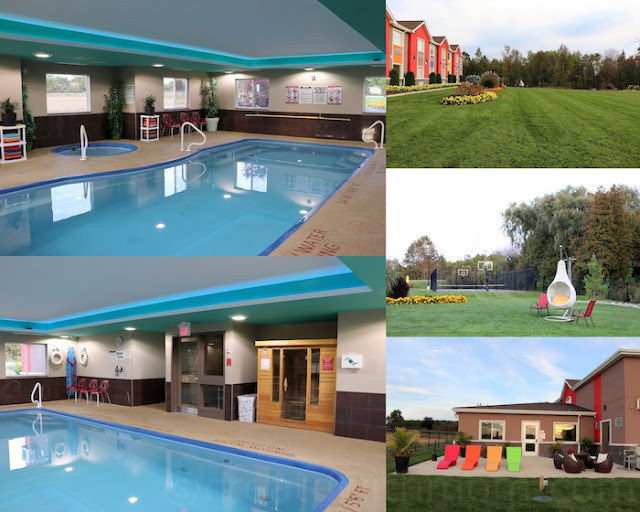 They have a beautiful indoor salt water pool, hot tub, sauna, fitness room, as well as a large open field with lots of seating, and a large court to play tennis, badminton, basketball and other sports. 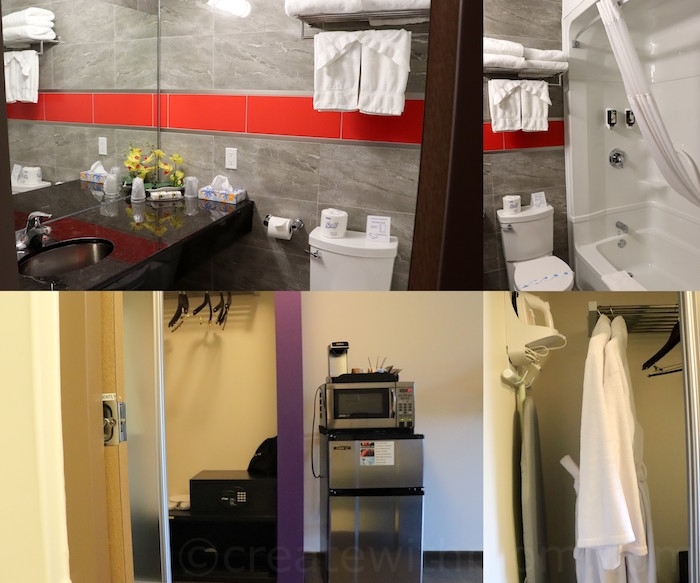 The stay includes breakfast with a variety of choices from a waffle station to bread, muffins, croissant, fruits, cereal, oats, coffee, tea, juice, yogurt and more. We found the staff very friendly, making our stay memorable and welcoming. 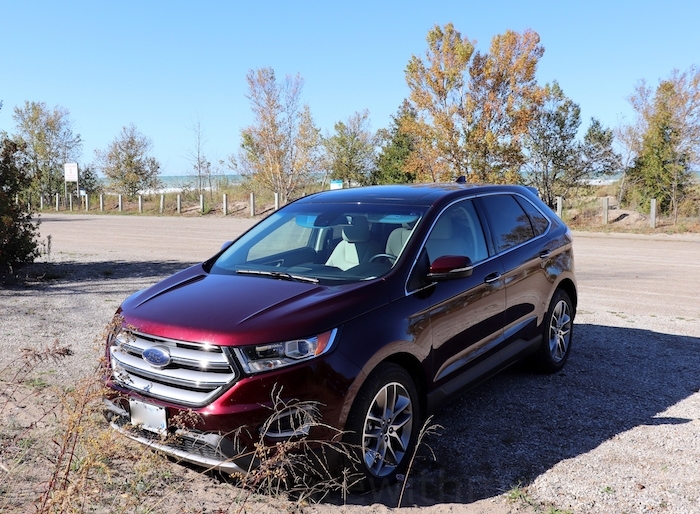 For this trip, we drove the 2017 Ford Edge Titanium, which was built at the Ford's Oakville Assembly Plant in Ontario. This is a lovely time of the year to go for a drive, as we get to see the landscape changing to show off beautiful fall colours. The 2017 Ford Edge Titanium has a bold design and lots of innovative technologies to accommodate five passengers. * Capability to tow trailers under 1360kg. * Standard Twin-Scroll 2.0: EcoBoost engine with All-Wheel Drive, six speed Selectshift Automatic transmission with Paddle Activation allows the vehicle to be responsive, and economical. * Active Park Assist: 12 Ultrasonic sensors can identify a suitable parallel or perpendicular parking space, calculate the trajectory and automatically steer the car into the space. All the driver needs to do is operate the accelerator and brake pedals. * Sync 3 technology helps keep our eyes on the road and hands on the wheel. We can simply push a button or use voice command. * Sony Audio System has 12 speakers and a rear subwoofer to give a crisp sound. On our way to Huron County we listened to a Canadian audiobook we downloaded through the Audible app, which was then synced using the phone's bluetooth to the Ford Sync System's Audio. We think this is a wonderful way to read or listen to books and keep everyone in the family engaged and benefit towards improving our creative thinking and literature. Only thing we wished was that the audio book paused when the Navigation system was telling the instructions, and when the car sent out warning signals such as during lane changes. In this trip we listened to Dear Life Stories by Alice Munro. This book has fourteen stories that talk about life stories of different characters, their emotions, and travels across Canada. We plan to visit the North Huron Museum in Wingham in the summer to take a tour of the Alice Munro Literary Garden. * The front seats can be heated and cooled, and the rear seats can be heated. * Standard Rain Sensing Wipers work well due to a camera in the front windshield which detects moisture and adjusts the wipers accordingly. * Panoramic Vista Roof lets passengers experience fresh air and nature. 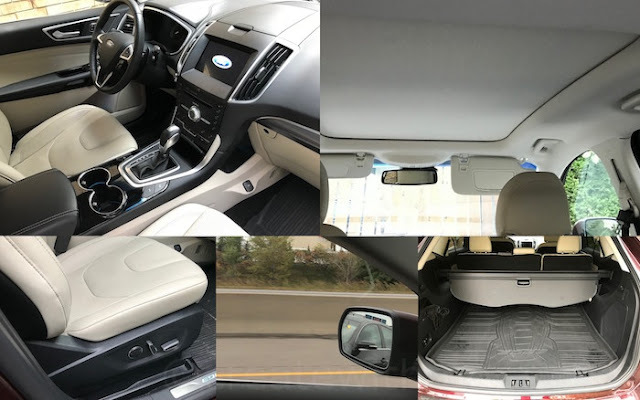 * The driver and front passenger seats are comfortable with features that can be personalized for our comfort. * Blind Spot Information System alerts traffic in the drivers' blind spot and gives a visual warning. The cross-traffic alert audibly warns drivers approaching from either side when backing out of a parking spot with obstructed views. 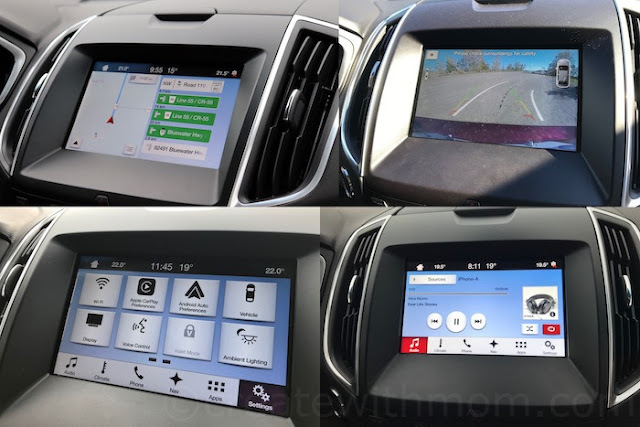 * The 180 degree camera with lens washer tucked into the grille lets us see what is happening in the front and front sides of the vehicle when a button on the instrument panel is pressed while the vehicle is slowed down or stopped. * A small forward facing camera behind the inside rearview mirror looks down the road and monitors lane markings to ensure the vehicle is on course and alerts the driver to maintain proper lane position. 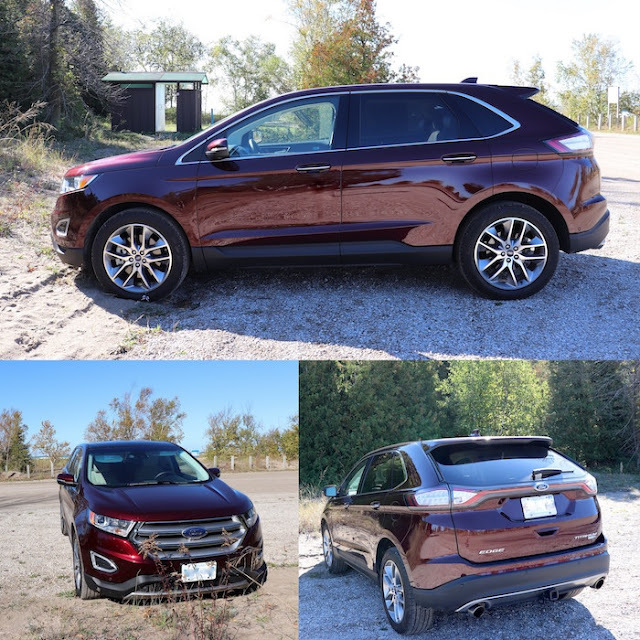 * Adaptive cruise control and collision warning with brake support lets us select our desired speed and space between the Ford Edge Titanium and the vehicle in front through preselected gap settings. The system's radar sensor detects traffic slowing ahead and makes the vehicle automatically slow down. After the traffic clears the vehicle resume the pre-set speed and distance. When the radar senses a potential collision, the vehicle will illuminate a red warning light on the windshield and a warning chime will sound first. If the driver doesn't react and continue getting closer the vehicle will activate pre-charge the brake support and increase brake assist sensitivity to provide full responsiveness when we press brake. We love this safety features so we can use the cruise control with confidence. * Adaptive steering manipulates the steering ratio to control the relationship between how much the driver turns the wheel and how much the wheels turn, for example low speed steering such as pulling into a parking space needs less turning of the wheel. Exploring the unexplored parts of Canada has become an eye-opening experience for us. It teaches us about people, history of our country, and gives us an opportunity to truly appreciate nature. What a fun adventure! That lighthouse looks neat to see. looks like a great vehicle for a roadtrip! Wow that place looks absolutely gorgeous. That vehicle must've made your trip perfect. 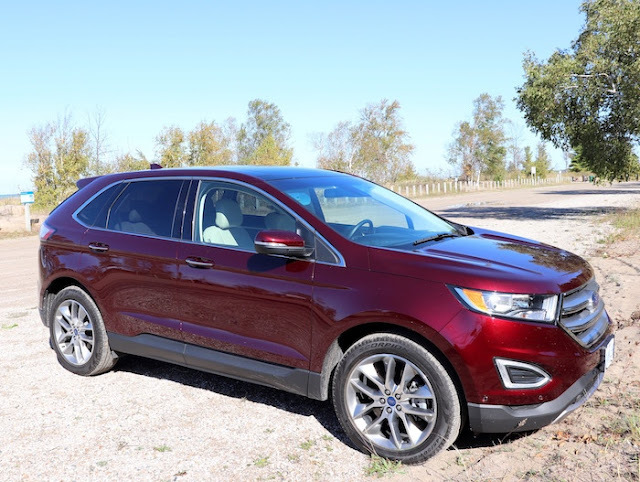 The 2017 Ford Edge Titanium sure sounds like a sweet ride! We're staying at a hotel with a saltwater pool this weekend. I'm excited to try it out. I love salt water pools! We used to go up island every year when I was a kid and the place we stayed at had the best salt water pool! Looks like a fun time you had! Love the Sync 3 technology. Sounds like a nice vehicle. Wow looks like a lot of fun. Great looking vehicle! So many great places in this country to visit. Even better in a vehicle this great! It is fun to explore areas that are close to one's home that you have never visited. Your photos are lovely. 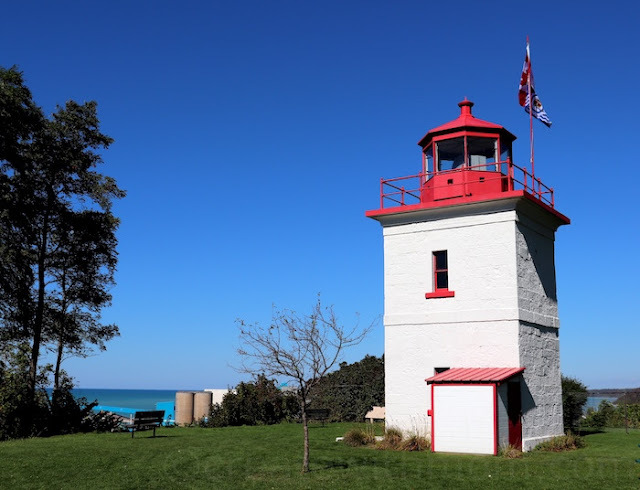 Your pics of the Goderich area are really beautiful & the Dreamz Inn looks like a terrific place to stay. Thx very much for your detailed review on 2017 Ford Edge Titanium, we're going to be looking for a new vehicle in the new year. The hotel looks really cool! This looks like a great car to have a road trip in! We are headed to Goderich in a couple weekends to camp at Point Farms. I'll have to keep in mind of the trails and see if I can find a trail map before getting there, thanks.